The Duke of Edinburgh has opened what is thought to be the UK's most sophisticated wave energy testing tank at Plymouth University. The £19m Marine Building heralds a "new dawn" for renewable energy in the region, said the university. The duke also unveiled a computer-operated ship simulator used to train future vessel captains. 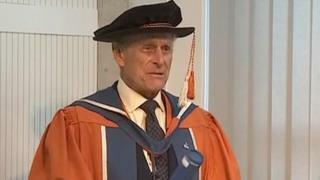 He has also been awarded an Honorary Doctorate of Marine Science by the university. The doctorate was awarded to "pay tribute to his distinguished and decorated career" in the Royal Navy. On the ground floor of the Marine Building, engineers will be able to test devices using waves, currents and wind. The second floor has the simulator to enable students to pilot vessels from super tankers to yachts in ports around the world. There is also a business support centre for wave energy firms. Prof Wendy Purcell, the university's vice-chancellor, said: "We are heralding a new dawn for the city, the region and the marine renewable sector, who will be able to use the building's research and development facilities to catalyse technological breakthroughs." The opening of the Marine Building follows the announcement on Monday of what could be the first wave energy machine for Wave Hub, a grid-connected test site about 10 miles off the coast at Hayle in Cornwall. Last year another wave energy testing site was announced in Falmouth Bay in Cornwall. Falmouth Bay Testing Site (Fabtest) will enable developers to test wave energy devices prior to linking up to Wave Hub.